Hattah-Kulkyne National Park lies in typical mallee country with extensive low scrub and open native pine woodland. Superbly adapted birds, animals and vegetation thrive in the poor, sandy soils and searing summers. The freshwater Hattah Lakes are seasonally filled by creeks connected to the Murray, providing food and shelter for waterbirds and fish. These lakes can remain full for up to ten years without flooding, but flooding generally occurs once every two years. 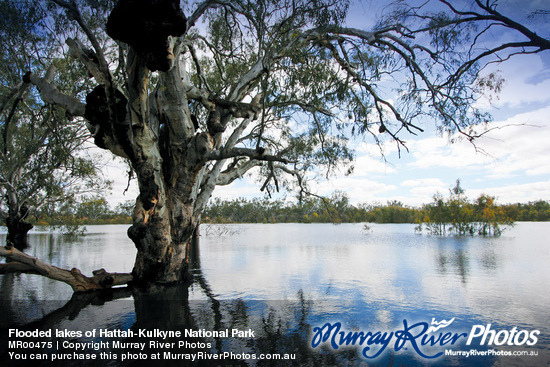 Hattah-Kulkyne is special because of the flow of water from the nearby Murray River that fills the freshwater lakes seasonally through creeks connected to the Murray. This water provides food and shelter for waterbirds and native fish. These lakes can remain full for up to 10 years without flooding, but flooding generally occurs, on average, every two years. The area supports a variety of native plants, two species of kangaroos, and the endangered mound-building Malleefowl. The area contains examples of the living culture of Aboriginal people. These include scars on trees where shields and canoes were made, and middens (heaps of shells discarded after meals eaten over many generations). This park is a vital conservation areas and contributes significantly to Australia’s biodiversity. The lakes are a Ramsar site and are protected under the Ramsar Convention on Wetlands. The lakes are important breeding areas for local and visiting water birds, while the area is home to over 200 species of birds, including the Regent Parrot, Great Egret and Malleefowl. One of the gems you will discover on nature walks.With a combined area of almost 50,000 hectares, there is always plenty to see and do. Noted for its range of protected flora and fauna, you can mingle amongst the wildlife for an extraordinary experience. More than 200 species of birds can he seen in the parks including Mallee fowl, Apostle Birds and White-Winged Choughs. With a wide array of animals living around the lakes, you may even discover huge goannas sunning themselves on hot days! The wide variety of plants and wildlife provide interest for nature lovers and intriguing subjects for photographers. Be on the lookout for evidence of the area's former Aboriginal inhabitants, including canoe and shield trees. For a relaxing view of the area's natural beauty, there are unlimited opportunities for hiking in the park, or experience the self-guided Hattah Nature Drive near Lake Hattah. A peaceful walk in the park; a leisurely fish for Yellowbelly and Redfin in the Murray; canoeing, kayaking and swimming are all essential when visiting Hattah - Kulkyne and Murray - Kulkyne Parks. Start baiting your hook at dawn. From the graceful River Red Gums hugging the lake, river and creek beds, to the native Cypress-Pine, Buloke and Mallee in arid areas, the shade of trees is never far away. Enjoy this land of difference, exploring the Murray River bends such as Jinkers, Fireman's and Tarpaulin Bend, or walk across the dry lakes. Maybe a hiking adventure is more your style, perhaps encountering a kangaroo along the way. Red and Western Grey Kangaroos are abundant in the park, wildflowers abound in spring and at night you may hear a Mopoke call. The contrast of the lake system, low mallee scrub and native pine woodlands is a sight you will never forget! Hear the distinctive laugh of the Kookaburra. Enjoy the quiet comfort of the lake. 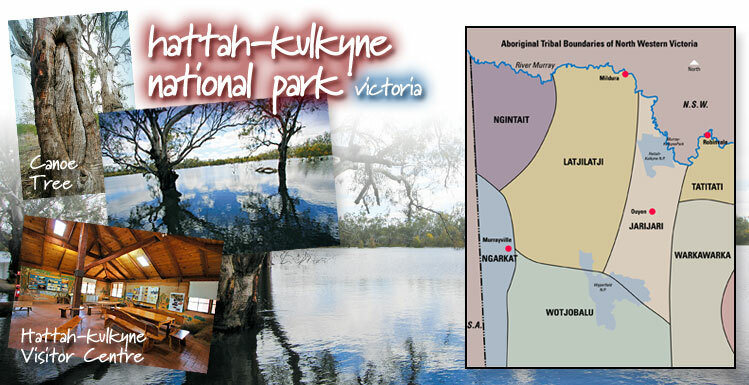 Hattah-Kulkyne National Park is about 450 km from Melbourne off the Calder Highway. It is 74 km from Mildura to the Park Office (off Robinvale Road). The parks encompass almost 50,000 ha of magnificent mallee, floodplain and dune country.